ONE OF THE biggest relics left behind by the Nazis is undergoing a radical transformation to become a luxury tourist destination. Developers are now bringing to life the hulking grey ruin on the German island of Prora, where Adolf Hitler failed to realise his dream of a giant beachfront indoctrination camp. The original complex was intended for up to 20,000 Germans as part of the Third Reich’s so-called Strength Through Joy propaganda programme, whose other lasting achievement was the Volkswagen Beetle, or ‘the people’s car’. Recreation and hearty exercise would have been coupled with on-site ideological teaching to build loyalty to the Nazis and strong racial identity among the “Aryan” working class. Building started in 1936 but halted with the onset of World War II in 1939, leaving a concrete skeleton known as the Colossus of Prora stretching 4.5 kilometres (2.8 miles) down one of Germany’s most stunning beaches. Under East Germany’s communist state, the camp served as military barracks so secretive that they did not appear on travel maps. “This is a site that quintessentially stands for both the Nazi and the communist eras, where you can gain a more complete picture of how both systems worked,” the director of one of two Prora museums, Susanna Misgajski, said. Since the regime’s collapse in 1989, the complex continued to crumble. The new look is targeted at moneyed urbanites, with a ramshackle art gallery and the down-at-the-heel ‘Miami’ nightclub now gradually giving way to a hipster burger joint and a bakery serving latte macchiato. “On the one hand there’s an interest in maintaining it as a memorial,” said sales representative Werner Jung of Irisgerd real estate, which is building the neighbouring 270-flat Neues Prora (New Prora). 95% of the apartments have been sold, thanks to tax breaks afforded to investors in listed buildings, a healthy economy and record low interest rates. Prices range between €350,000 for a 100-square-metre (1,000 square foot) ground-floor flat and €650,000 for a penthouse with a spectacular sea view. 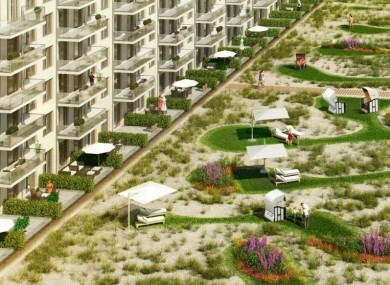 “It is basically the last new complex in Germany where you have direct access to such a gorgeous beach,” Jung said. “We have enough memorials in Germany,” said Karsten Rarrasch, 50, a postman from nearby Stralsund who was building a sandcastle with his grandson. So many years have passed, it’s time to make something beautiful out of Prora. This is a place where 20,000 people were to be groomed to work and wage war. The two museums hope to merge in a permanent space to ensure that Prora’s history is not whitewashed or forgotten. But the plan will depend in part on the outcome of an election on 4 September in Mecklenburg-Western Pomerania state, Chancellor Angela Merkel’s home district, as to whether they can count on government support. The right-wing populist Alternative for Germany (AfD) is polling at around 20% with an anti-migrant platform – within striking distance of Merkel’s conservatives. “Of course it isn’t a Nazi party but the AfD has grown strong because the refugee problem has scared people, particularly those without much contact with foreigners,” Misgajski said, noting that Prora’s youth hostel was used to house asylum seekers last winter. The complex belongs to a small group of mammoth Nazi relics including the Nuremberg party rallying grounds and Berlin’s grandiose semi-circular Tempelhof airport terminal. Lucke noted that the Nazis’ architectural ambition was intended to inspire awe, an effect that endures to this day and demands sensitivity of developers. Email “Nazi resort ruin is being transformed into a luxury tourist destination”. Feedback on “Nazi resort ruin is being transformed into a luxury tourist destination”.